"We have updated our lithium production forecasts for Chile and Argentina to reflect a relatively slower-moving project pipeline due to regulatory hurdles in the former and growing exploration efforts boosting long-term output in the latter. While we have revised down Chile's lithium production growth rate slightly in 2018, we maintain a quite positive outlook for the sector and expect both countries to drive global lithium production, along with Australia, over the next decade," the document reads. In detail, BMI says that slow project development in Chile is due to the country's strict control over lithium production levels and Codelco's delayed announcement of a partner with whom to develop lithium deposits. 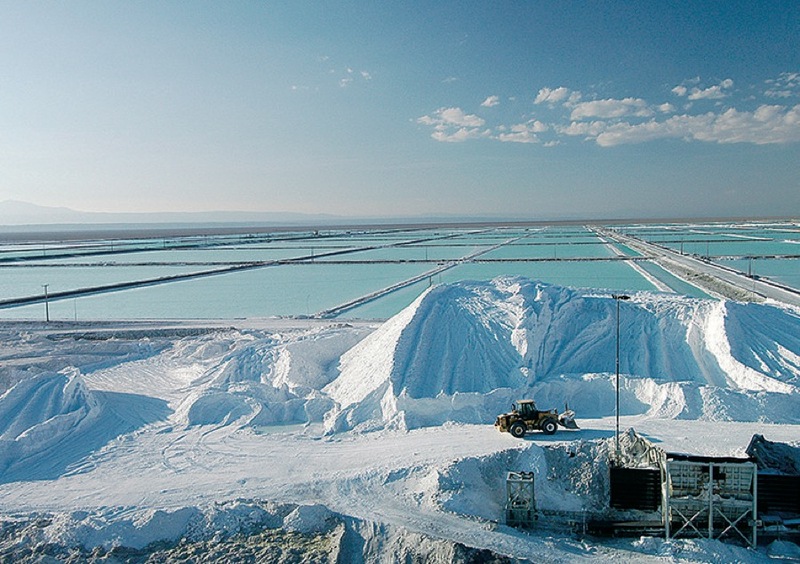 Nonetheless, the market researcher says that key investment opportunities in Chile's lithium sector will continue to garner interest particularly following the election of centre-right president Sebastián Piñera and the fact that development agency Corfo announced it had received proposals from six companies to advance metallic lithium and lithium cathodes, including three Chinese firms, one Russian, one South Korean and one domestic. "The projects, each estimated to cost between $200- 350 million, will be sourced with lithium concentrate from Albemarle Corp.," BMI states. Albemarle is in the process of getting approval for a proposal it submitted back in September 2017, which would see the company increasing its Chilean lithium production to 125kt by 2020. BMI's forecast also reflects a steady ramp-up in production from SQM, as Chile's top producer plans to increase lithium carbonate capacity to 63kt by H218 from 48kt, and given that it has already entered a 30 day conciliation process with Corfo, following allegations over unpaid royalties and taxes, environmental violations and illicit political financing. Argentina, on the other hand, is expected to become a larger producer by 2020. BMI explains that the reasons behind such growth are a strong project pipeline, competitive operating costs, a supportive regulatory environment under President Mauricio Macri and the fact that several junior miners with exploration projects in the country will prove ripe for consolidation among larger foreign lithium players, who would bring expertise to the country's nascent sector. FMC Corp's 300-million expansion of its Hombre Muerto operations, which would double its lithium carbonate output to 40kt. 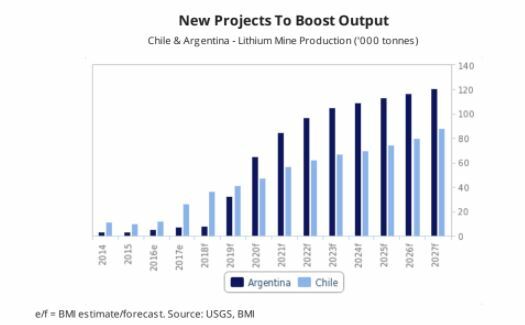 BMI concludes that, in light of these developments and the fact that lithium-ion battery producers are racing to secure supply, Chile's and Argentina's coffers can expect to receive significant amounts of money from the lithium mining sector in the coming quarters.